Who Rigged Pakistan’s General Elections 2018? The aftermath of 2018 general elections continues to haunt the bigwigs of Pakistani political arena. We saw the old tried and now rejected politicians join hands under Grand Opposition Alliance against Pakistan Tehreek-e-Insaf, a party that is all set to form governments in KP, Punjab and Centre. Members from PPP, PMLN, MMA, ANP and PKMAP all decried the alleged rigging in GE2018 but the question is, who actually rigged the elections? 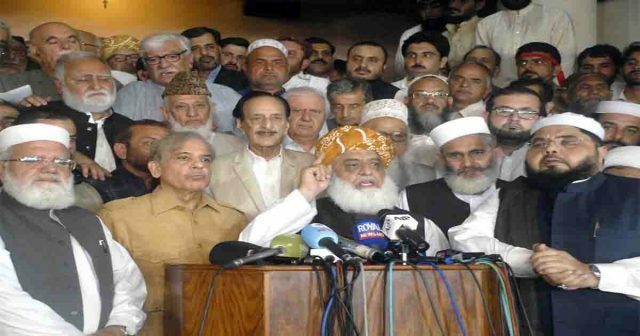 A case in point, Mehmood Khan Achakzai’s PKMAP party lost almost every seat to Maulana Fazlur Rehman led MMA, the same party they have joined hands with to protest against the alleged rigging. His candidates in NA 263 and NA264 were beaten by MMA. In the provincial constituencies of PB1, PB3, PB18, PB19, PB20, PB22, PB23, PB25 were won over by MMA while PB24 was won by an ANP candidate. So if Achakzai thinks his mandate was stolen then why is he joining hands with the beneficiaries? Similarly, if Fazlur Rehman thinks the election was rigged then why can’t he make his members resign from their seats and contest fresh polls on at least those seats? Same goes for PPP. They were able to get 11 more seats than 2013. They swept in interior Sindh yet they’re still claiming that elections were rigged. Last but not the least The PMLN. They appointed Army chief; they along with opposition leader, appointed Chief Election Commissioner; they along with opposition leader, appointed caretaker PM; they appointed NADRA chairman. And, if they still claim that elections were rigged then one would think it’s a ploy to cover their failure. Both PMLN and PPP have been in government for decades but failed to build a transparent electoral system. Since PTI has come into power with the slogan of change, the people of Pakistan expect them to do all they can to strengthen the ECP and introduce a transparent system that ensures free n fair elections in future.